Hello! 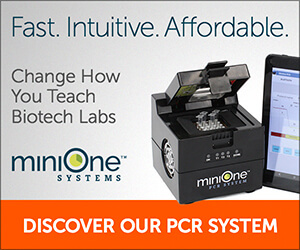 I’m Diane, an AP Biology teacher who attended a recent MiniOne workshop in New Jersey, and I’d like to share an interesting revelation I had while working with my MiniOne DNA Electrophoresis System in my classroom: it’s possible to store casted electrophoresis gels overnight! I’ve been interested in figuring out a possible storage procedure for casted electrophoresis gels. On one occasion, my students had poured gels, but we did not have enough time to run them. To try & salvage the gels, we poured buffer solution over the surface of the gels, and placed them in the refrigerator. Upon the recommendation of the MiniOne team, I removed most of the buffer solution leaving a thin layer of buffer, and returned them to the refrigerator. I’m happy to announce that the following day, the gel run was perfect! 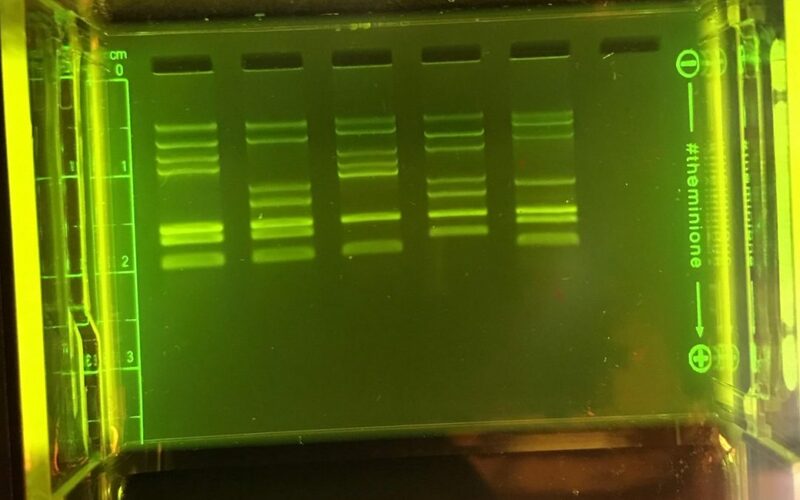 We did the MiniOne DNA Fingerprinting MiniLab, and the bands were tight and beautifully “lit up”. The students were excited to visualize the DNA bands & analyze their results. As teachers that are often strapped for time, we all know things invariably take more time than you planned for. To my fellow teachers who use the MiniOne Gel Electrophoresis System in their classrooms, I’m excited to let you know of an additional time save measure: electrophoresis gels can be poured the day before, stored in the refrigerator overnight, and run the next day! 1) Pour gels. Allow time for polymerization. Fill the casting chamber with buffer solution, which allows a complete filling of the wells. 2) Pour off most of the buffer leaving a thin film of buffer solution over the surface of the gel. The wells remain filled with buffer. 3) Cover the casting chamber & place the gels in the refrigerator overnight. 4) The following day, run the gel(s). I hope my fellow biology teachers are able to use this tip to save even more precious time in the classroom. The MiniOne System is fast and convenient– but we could all use even a few extra minutes each session, right?